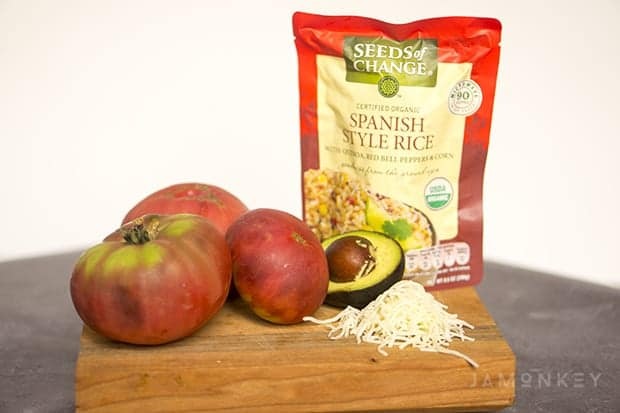 This recipe is brought to you by Seeds of Change and the Save the Flavors campaign. I showed you last week how to grow Cherokee Purple tomatoes at home, and that Seeds of Change is giving away seeds to plant your own. They are doing this because the Cherokee Purple tomato is slowly disappearing, and they want you to Save the Flavors. Now that you have the knowledge and seeds to grow your own, here is a great, simple recipe on how to cook with them. 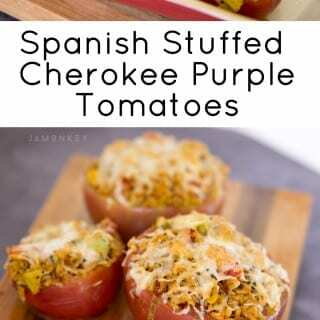 This Spanish stuffed Cherokee Purple tomato recipe is great as a side dish with dinner or as your dinner! 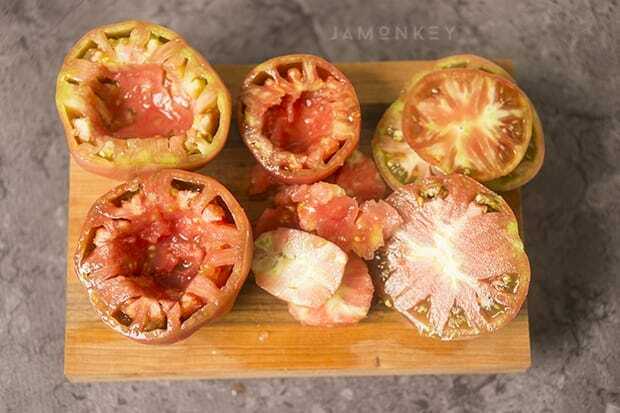 These heirloom tomatoes are good sliced up and eaten by themselves, but I wanted to try something new with them. 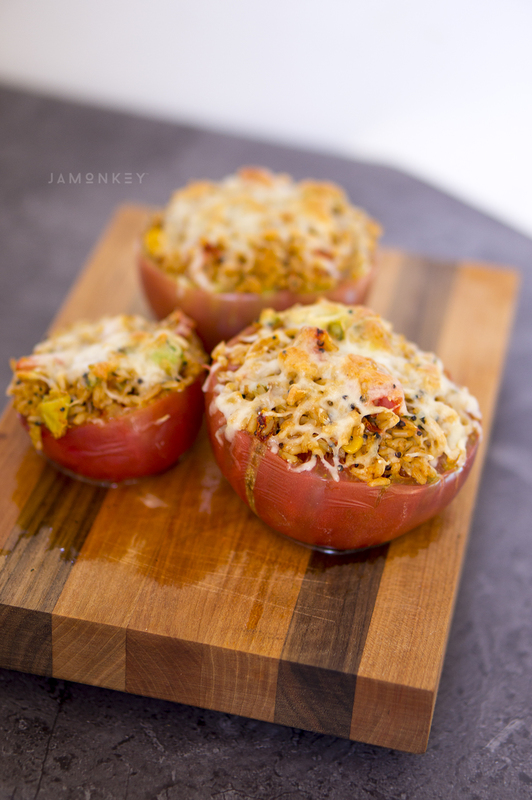 You'll start by cutting the tops of the tomatoes off. 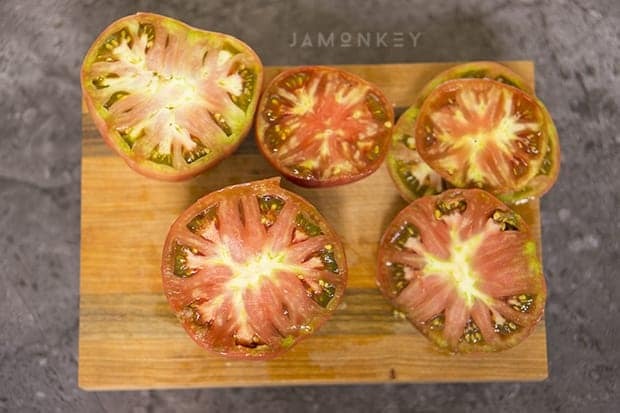 Heirloom tomatoes curl up a lot on the top so make sure you are getting all of the stem. I found that the green portion at the top made a great guide. Cut the center of the tomato out and set aside. You want to leave about an inch of space from the outside so that they don't fall apart while baking. 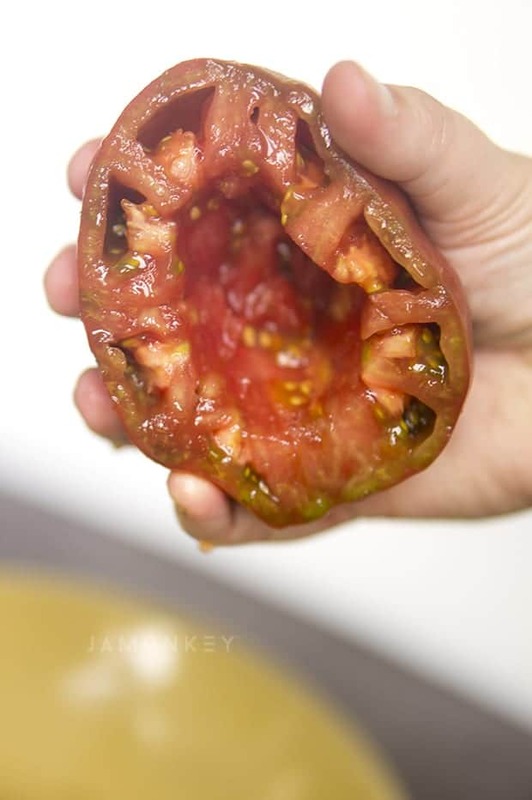 Over a bowl, lightly squeeze the outside of the tomato to loosen and discard the seeds. (Or you can dry them out and plant them next year!) Place the tomato upside down on a paper towel to absorb some of the liquid while you're preparing the rice. 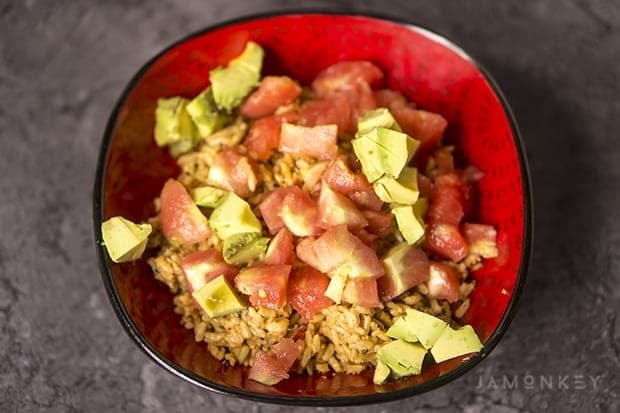 Chop up the meat from the tomato and half of an avocado. Blend it with the Spanish rice. 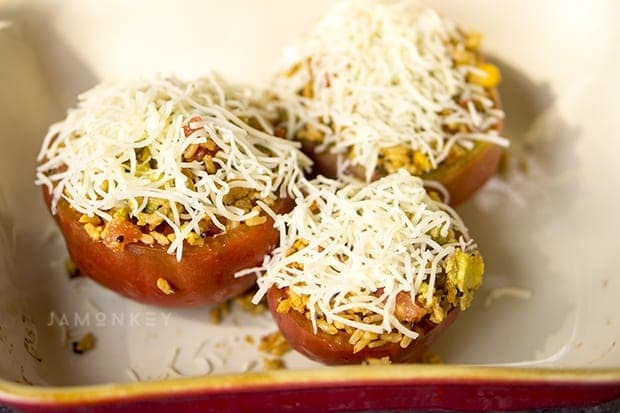 Spoon the Spanish rice mixture into the Cherokee Purple tomatoes. Try to fill the rice into the seed pockets too. I made sure that the mixture was heaping out of the top. 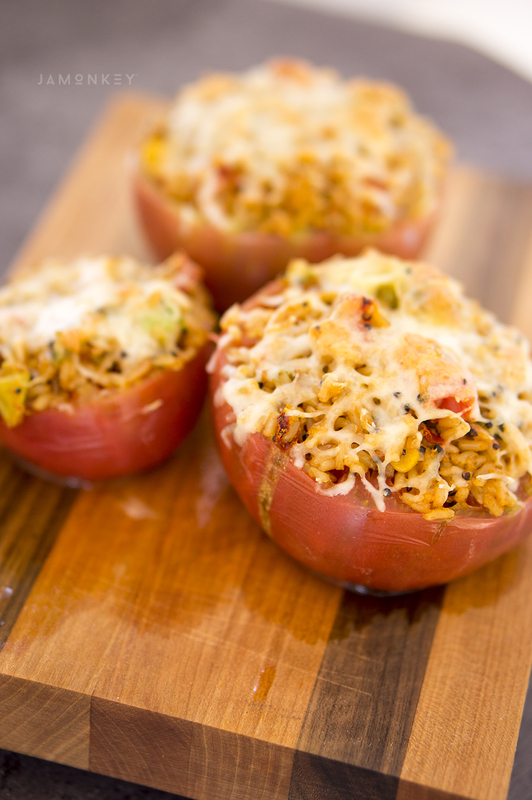 Sprinkle a little shredded cheese on top of the stuffed tomato. 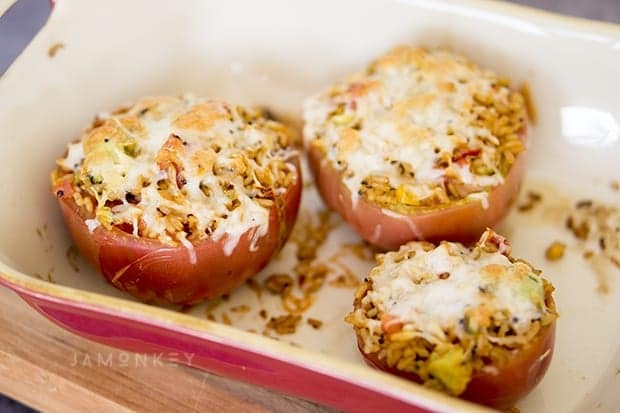 Bake at 425 for 10-15 minutes or until the cheese is melted and the skin of the tomato starts to crack. Wow, these look delicious. 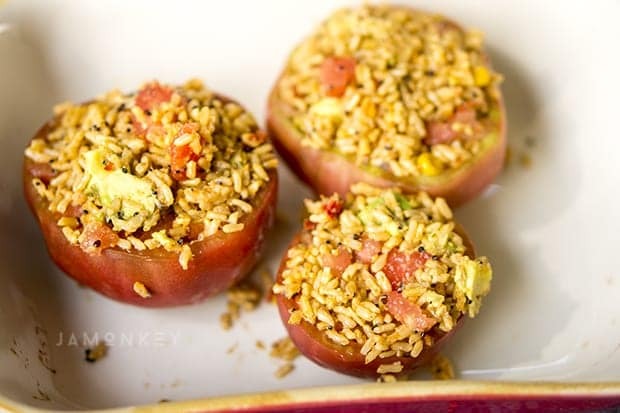 I love the deep flavours of heirloom tomatoes and any recipe which calls for avocado is a winner in my books. Thanks! I’m the same way, I love avocado on everything!